When using any of the searchers available in the Search API, four results are returned by default. Historically, it has been possible to request a large set of eight results (or ten for filter Custom Search Engines), but that’s it. We understand that there are many use cases for this API, and some of them require a finer grain of control over the number of results displayed. With this addition, you can now request an arbitrary number of results, based on the exact number you need. By requesting only the results you’re going to show to the end-user, you can make your site or app more efficient. Also, this will control the cursor values that can be used to retrieve subsequent pages of results (and impact paging in the Custom Search element). For more details, check out the documentation, and if you have any questions, stop by our IRC channel and support forum. Earlier this year, we launched the Tashkeel (Diacritization) service on Google Labs. I'm pleased to announce that we've added an experimental Diacritization component to the Google Language API. This is a simple JSON API which you can use to add diacritic symbols to strings of Arabic text. A URL-encoded string is supplied as the message parameter, and it's returned by the API with diacritics included. These symbols are useful to people just learning the language and as an important pre-step for several text processing applications. One of Google's most popular APIs is our Feed API. This API is found all over the web, making any feed content available for developers to embed on their sites. A problem with embedding content in this manner is that there's no good way to make sure that your visitors see the freshest data, regardless of how long they stay on your page. Of course, you could try polling (also known as the "are we there yet?" method), repeatedly reloading the feed to see if the content has changed. This technique is generally a waste of bandwidth and doesn't always result in very low latency. Instead, we've got something better. I'm pleased to announce a preview of a brand new version of the Feed API, which includes push updates. With this new version, you'll be able to make the latest feed data available to your visitors - when it's available - without polling or requiring a page refresh. The best part is that this will work with any PubSubHubbub enabled feed. As the video shows, this new version works much like the older Feed API. But instead of loading the existing feed data, you actually subscribe to the feed, and your callback is executed any time new feed data comes in. For a running example you can try out, check out the Code Playground. We want to encourage you to experiment and build innovative applications with this new API - but since we don't know how it will be used, we can't quite open the floodgates yet. Therefore, we're initially making it available on a sign-up basis. Please fill out this form, telling us a little about how you'd like to use this API, and we'll try to give you access as soon as possible. Also, please remember that this is a Code Labs version, and therefore it may change or be removed at any time. After we get some data from this experimental period we'll be able to open it up to everyone. Once you've begun experimenting, be sure to stop by our support forum or IRC channel to share your creations with everyone. If you'd like to learn more about how this API works, our Google I/O session will be posted to YouTube soon. We're excited to announce the addition of 6 new languages (Greek, Russian, Serbian, Sanskrit, Amharic, Tigrinya) to the Transliteration API. Using Google Transliteration you can convert Roman characters to their phonetic equivalent in your language. Note that this is not the same as translation — it's the sound of the words that are converted from one alphabet to the other. Transliteration API allows this functionality to be available to all websites, which will make it easier for you to add transliteration capabilities to textfields on your webpages. Using this customizable API, you can enable users of your website to type 19 languages. For more information, please take a look at the documentation and samples at our code playground. If you're looking for a finer level of control on your web pages, also check out the low-level interface to transliteration, and the font rendering support APIs. Google Transliteration is integrated into several Google properties and we have bookmarklets in addition to API to extend this capability to other websites. Please try these out and let us know what you think and how you're using it. Last year we introduced Rich Snippets in Custom Search, allowing you to define your own custom attributes that we'll index and return with your custom search results. A few months later we showed you how to render some of these rich snippets in your Custom Search element. Sure, this was a powerful way to let your visitors see thumbnails or interact with the results via actions. But we felt it was still too constrained. It is with great pleasure that today we're announcing that you now have full rendering control of all your metadata in the Custom Search element. The results really jump out at you, huh? The thumbnails really help users see what they're looking at, but we've shown you those before. Same with the Download action links by each result. But never before could you include arbitrary, per-result metadata with your Google Custom Search results so easily. Notice the author, length, views and date information in each result. There's even an icon representing each result's document type. So how can you add this to your page? Let's take a look. First, you need to include custom attributes within your webpages, either via microformats, RDFa, or a special markup called PageMaps. A PageMap identifies specific attributes that Google recognizes and indexes, and then returns along with search results. Our prior blog post on Structured Custom Search tells you how to add PageMaps to your site. Please keep in mind that your site needs to be re-indexed, which can take some time. Therefore, your PageMaps might not show up immediately. It looks okay, but let's make it better. This replaces the default thumbnail rendering code with a similar version that sets the image dimensions directly. <div data-if="Vars.richSnippet && Vars.richSnippet.action" class="gs-actions"
Didn't quite catch all of that or want to do even more? Check out the documentation. The best part of announcing new features like this is seeing what innovative implementations people come up with. Don't keep us waiting - come show off your handiwork in our support forum or IRC channel! I'm always amazed at the creative ways developers use Google's APIs. I'm always pleased when we are able to add a new feature to the API, as I know that someone, somewhere will do something cool and unexpected with it. The latest addition is to the Image Search API. You can now restrict results by various licenses applied to each image. You can experiment with a live example of this in our Code Playground. For a full list of the attribute combinations for each type of license, perform an appropriately restricted search on Google Image Search's advanced search and take a look at the as_rights parameter in the URL on the results page. Please come visit our IRC channel and support forum and let us know how you've used this feature in your site or app! More and more sites are adding support for MediaRSS to include images, videos and other types of multimedia files. Today, we're announcing that the Google Feed API now includes this metadata in the response. This content is now included in the JSON and XML results returned by the API. For more details on the result format, check out the documentation. Please note that complete MediaRSS content is generally only available in feed entries newer than February 1, 2010. Questions? Comments? If you're attending Google I/O, come meet the team and learn more about the Feed API at our Office Hours. If you can't wait that long, there's always our IRC channel and support forum. One of the major advantages of an Ajax style search box is that users can perform their queries and get their results without leaving the page. However, some webmasters prefer that their users go to a separate results page after they enter a search. 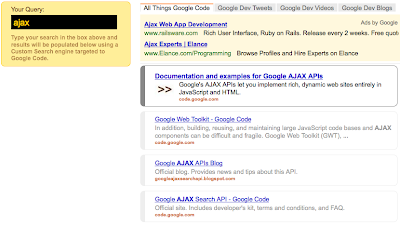 The Ajax search library supports this "two-page" use case as well, and since this is a question that we see from time to time we've set up a simple demo site. // See the source code of the results page for full details. // Set drawing options to use our hidden input box. // Change the draw call to include our new options. To see an example of a two-page search setup with a hidden query input, visit this page. To learn more about the Google Custom Search API, read our documentation. If you run into any problems while setting this up, post your question in our discussion group or hop on our IRC channel. One feature of the AJAX Image Search API that you might find useful is the ability to retrieve only the images which are visible on a specific website. For example, you could add a search box that allows people to search through just the images on your own site or you could create a slideshow which shows images from your favorite site. We can do more than just provide a site-specific image search box, we could also use the search results in a unique way. For example, we could create a slideshow which shows images which match our desired keyword and appear on a specific site. For this example, let's create a simple slideshow that displays images from nasa.gov. // Switch to the next image every 5 seconds. In the above samples, there are three lines I'd like to call your attention to. The first line to note is the imageSearch.execute at the bottom, here we've entered the keywords that our slideshow images should be related to. Next we restrict the site to nasa.gov using imageSearch.setSiteRestriction. Lastly, we call setInterval once we receive the results of our search for images. The setInterval call tells the browser to run our nextImage function every five seconds. 'http://www.flickr.com/photos/<username>') to search the photos that have been posted by a particular user on flickr. To learn more about some other neat features of the AJAX Image Search API take a look at our code playground samples and documentation. For questions on this and other topics, drop us a line in the discussion group. To help us discourage this behavior without affecting legitimate developers, we're adding a new parameter to the RESTful interface, userip. With this parameter, developers have the option of supplying the IP address of the end-user on whose behalf they are making the API request. Doing so will help us distinguish this legitimate server-side traffic from the more abusive scraping in which there are no end-users. Check the documentation for usage of the new parameter. We'd love to hear any comments, questions or problems you're having in the support forum. I am happy to announce the addition of the ability to scope your searches to a specific country in the AJAX Web Search API. Now, if you have a lot of visitors in Madagascar, you can make sure that the search results displayed on your site are tailored to them. All it takes is a small change to your code. Most valid country codes will work, as long as Google has a home page on that country's top level domain (e.g. google.es). If you use an invalid or unsupported country code, you'll get an error message letting you know. We're excited to bring you this addition to the API, and look forward to seeing the innovative ways in which you use this new feature to improve your users' experience. Please drop us a line with your thoughts (or questions) on our discussion group. As a short example, I've created the following simple demo which just detects whether Google Chrome Frame is installed or not with an alternate message if you are in a browser for which this plugin is not available. Do you have Google Chrome Frame installed? We're checking on that now. Ben Lisbakken has also added detection for Google Chrome Frame to the Ajax Playground. If you view source on the page you can see another example of a customized CFInstall.check implementation which is designed to fit the page. For more details on the Google Chrome Frame Ajax API, see the documentation and for questions, please visit the discussion group. The language APIs keep right on trucking, released recently are a handful of new translation languages, pairs, and keyboard layouts. With the addition of the above the total count for language pair combination comes to a mind boggling 2550 pairs. In addition, we find the above additions exciting because, for the first time, African languages are available through the API and we now support all 23 Official European Union languages. 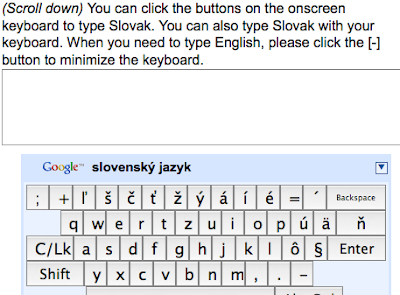 Here's a simple example of using the Slovak keyboard layout. AroundMe is an iPhone application where the AJAX APIs are central to the user experience. Specifically, the app utilizes the Local Search API to enable users to find information about their surroundings. In the videos below, Marco Pifferi (the developer behind AroundMe) gives a demo of his app, his thoughts on using the AJAX APIs, and tips for integrating them in mobile apps. Mibbit is a web-based chat application that uses the AJAX APIs to enhance the chat experience. The language APIs help users to translate their messages into a number of different languages. Mibbit also uses the Maps API and YouTube API to display embedded maps or YouTube videos if a user includes a Maps or YouTube URL in their chat. Jimmy Moore, creator of Mibbit, walks through Mibbit in his video below. Do you have a great app that uses the AJAX APIs? Submit a video about it and we may feature it on this blog. Questions? Stop by our support forum or IRC channel. It is often difficult for Internet users to input text in many non-Latin script-based languages for a variety of reasons. The correct keyboard layout may not be installed on the computer they're using - sometimes such a layout may not be well developed or widely available. This poses a challenging problem for web developers because there is no way they can ensure that their users have access to this very basic input technology. Our Transliteration API can help, but requires that the user know multiple languages. Right on the heels of introducing support for translating Persian (Farsi), we've added a new Virtual Keyboard API into the Google AJAX Language API to further assist with text input. With this, developers can help their users input text without relying on the right software being installed on the computer they happen to be using. This gives you the control to provide a better user experience, even for multilingual websites. By creating multiple keyboards with different layouts, each text field can be bound to the appropriate keyboard - and the user will see only the keyboard attached to whichever text field has the focus. But don't take my word for it - check out a sample for yourself. Notice that in addition to allowing users to click on the virtual keyboard, it also temporarily transforms the key assignments on their physical keyboard, allowing rapid typing for those users accustomed to a given layout. We plan to roll out support for more keyboard layouts in the future. But in the meantime, read through the class reference and see the rest of the Code Playground samples. After you've had time to experiment, let us know what you think and which other layouts you'd like to see. Feedback is always welcome in our support forum and IRC channel. Thanks to all for the requests to add ext-core to our Libraries API, and big thanks to Ext JS for providing their library so openly! For more information, head over to their blog post. The AJAX Search gadget for Blogger is now available to all users on Blogger.com. This gadget accesses a Custom Search Engine (CSE) that is created automatically for your blog and provides search results inline, with the look and feel of your blog. You can get all this with just a few clicks from the Blogger control panel. One cool feature of the gadget is the 'Linked From Here' feature that searches the pages you've linked to from your blog posts. As you create new posts, we automatically update your search engine to include all the linked pages, as well as all the pages linked from your link lists and blog lists. Check out the gadget — the search results match the look and feel of your blog and show up inline, as shown in the screenshot below. You can click a button to dismiss the results when you are done, and go back to reading the current post. If you are not using Blogger, you can still create something similar for your website using the Custom Search element (read more about this new element at the Custom Search blog). Each element is designed to help you get started quickly without spending time on the deep technical details. Yet behind it all, Google Web Elements are powered by Google's scalable and flexible developer APIs, offering a world of customization just beneath the surface, keeping up with your site as it grows. For more details, check out the Google Code and Custom Search blogs. Google Web Elements are already available for eight of our most popular products, with more soon to follow. To get started, visit the Google Web Elements homepage and please be sure to let us know what you'd like to see us work on next. Want to know what else is going on at Google I/O? Follow us on twitter @googleio and twazzup. The breakpoints and Firebug Lite additions are my favorite new features. But why did I include Firebug Lite when all web developers (should!) have Firebug installed? Because when code runs on the Playground, it runs in an iFrame. That iFrame does not have the Firebug object initialized in it. Since it is a cross-domain iFrame, there's no simple way to add Firebug to the iFrame's window object, so adding Firebug Lite was the best approach. This makes it so you can now use all of your favorite Firebug debugging convenience functions in the Playground! To use Firebug Lite and breakpoints, simply click on the line number you want to add a breakpoint to and hit "Debug Code". This will insert Firebug Lite into the output and pause the execution on the breakpoint line number until you to click the play button to continue. Try adding a breakpoint to a line, clicking "Debug Code", then opening Firebug Lite and typing in a variable name to inspect the contents/value of the variable at that point in the code. Adding breakpoints and forcing Firebug into a local function context were really fun engineering problems, so if you want to check them out (or contribute code to the Playground) go to the open source repository for it, come chat it up on IRC, or talk with me in person at the quickly approaching Google I/O conference (early bird registration runs until May 1). Also, it's really important that you share your feedback so that I know what you'd like to see in the next version of the Playground! Thanks, and enjoy the Playground! We started nextstop.com with the idea that we could make it significantly easier and more fun to discover new and interesting things to do anywhere in the world, based on recommendations from people who know a place well. Whether it was a neat museum, a hidden local restaurant, or a great place to go shopping we wanted to make it super easy and fun for people to share recommendations for their favorite places, wherever they might live. The trick of course was in how to do this. It was important for us to combine ease of making a recommendation -- our goal was that it should be as simple as entering the name of a place, and a few sentences about why you liked it -- with rich information about a place so it was really useful to others -- photos, contact information, maps, etc. The solution, not surprisingly since I'm writing here, was to use a number of Google's APIs to gather related information about the recommendation and make it easy for our members to include it in their recommendation. You can best see how this works by going through our recommendation flow, or watching the video below. 1) When the page loads, the first thing we do is use the Google loader to load the JQuery and JQuery UI libraries, as well as Google Maps. As part of this, we also grab the user's current location using google.loader.ClientLocation and store the lat/lng if available to use later. 2) In step 1, we ask the user for what's being recommended. We use this string to do a Google local search for business listings and KML results that match, using the user's current location to bound the local search by setting the sll and sspn parameters. Between local business listings and KML results, we can offer incredible global coverage of everything from restaurants to tourist attractions to hole-in-the-wall bars and clubs. We're using the JSON version of the local search API, which we call from our servers using Python's urlopen() so that we can supplement the results with our own database of results. 3) In step 2 we do an image search for related images using Google's image search API. While we let users change the search terms to find just the right picture, often our default image search (which combines the name of the place and a city name) returns great results. There are photos of almost everything, so you can even recommend a particular dish at a restaurant in Taipei and have the photos to go along with it. 4) In step 3, we ask for a few sentences about why that place or activity really stands out to them. After the recommendation has been submitted, we use the Google Language APIs to detect the language of the recommendation, which we can later use to filter content by your language, and we hope to someday integrate the ability to translate recommendations into your language of choice. Its a very simple and fast process for the user making the recommendation, but the result is a recommendation with address, phone number, map, and photo that is really useful to another user looking to discover something new. We've built our whole product around the Google APIs, and feel like we're just scratching the surface of what's possible. We're planning to let users add other information (like related websites, searches, news, etc.) using Google's APIs as well. We'll be at Google I/O on May 27-28 talking about what we've done so far, and will hopefully have a few new uses of the Google APIs to show off at that time. Please come say hello -- we'd love to hear your feedback on nextstop, or share tips on using the Google APIs. You can also check out some of the places recommended near the Moscone center, or add a few of your own! Optionally, you may also specify an AdSense for Search channel (more info on channels), the Ad Safety Level to associate with your advertising, and the language in which to display results. For a full list of options and details on including them, see the GoogleBar documentation. Note: currently ads only appear for results that are inline - this limitation should be removed within a few weeks. If you'd like to learn more about the new underlying, low-level Local Search Control, the reference documentation and Code Playground examples contain everything you need to know. For more information, see this recent post on the Maps API blog. Questions or comments? Please visit the AJAX API and Maps API discussion groups.